Please help us recover our money as the PF government is conniving with DEC and BOZ to steal hard earned money from citizens who are trying hard to invest their money to make ends meet in these difficult economic times. A company called Heritage Coin Resources LTD was formed a few months to among other services partner with citizens then trade in cryptocurrencies after which profits are shared with us,the partners. We got loans from various banks, our life savings, retirement packages just so we can make something..
Two weeks ago DEC/BOZ raided the Heritage offices claiming that the company was illegal and involved in illegal trading of cryptocurrencies..
BOZ then released a statement clearly stating that it was illegal to deal in cryptocurrencies and even warned us to do it at owners risk. As a result,the Heritage offices where closed and accounts frozen. All attempts to reach Heritage coin resources management have been futile both by voice call or messaging and we don’t know what’s happening. They created What app groups to up us as partners but nothing. Colleagues have visited DEC who advised that they are still investigating Heritage coin resources and that money wont be given back to us investors as they want to use it as evidence in court. Innocent citizens who invested their hard earned cash are being tormented. We are receiving demand letters from the banks and money lending companies due to the defaulting as a result of not being paid our money because of these DEC people. Others invested school fees and have been suspended from school as a result..
4 of our colleagues have died due to stress which led to high BP and sugar level..
Another committed suicide as his house has been grabbed which he used as collateral. Help us get our money please.We are innocent in this fight between Heritagecoin Resources LTD and DEC.
Why cant Heritagecoin Resources LTD pay us as they continue to pursue their battle? This is unfair by DEC.
We have partnerships forms and deposit slips as proof if they want to take them to courts. We are suffering under this PF government. We have been informed by a senior DEC officers that there is a plan by PF to grab these funds so it’s forfeited then they pay debt. 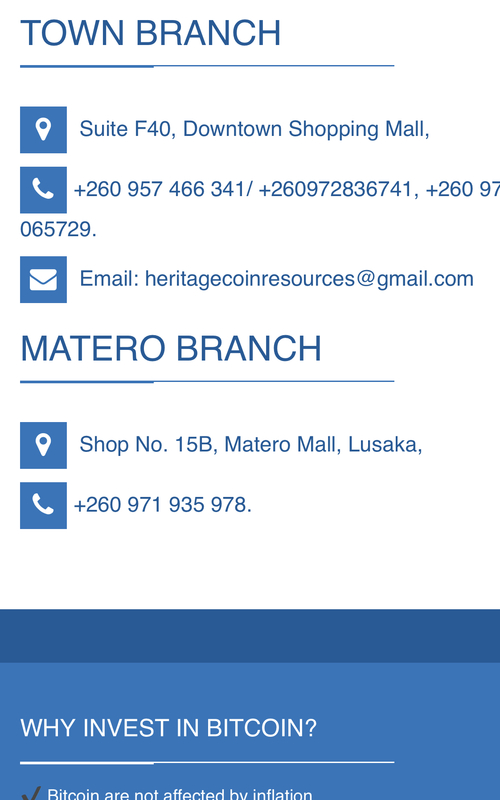 Heritagecoin Resources LTD was registered by PACRA, Registered with ZRA and have been remitting tax to ZRA. The place has had Zambia Police guarding the premises 24hrs. So was this government providing security to an illegal company? Is ZRA continuing to get tax from an illegal company? What kind of thirst for money is this? We are suffering. We are now taking legal action against both DEC and Heritagecoin Resources LTD so they give use our money back. We shall walk naked down the streets until they pay us our money. Publish this syndicate to steal money from innocent citizens to fund lifestyles and debt.